� Copyright 2015 American Meteorological Society (AMS). Permission to use figures, tables, and brief excerpts from this work in scientific and educational works is hereby granted provided that the source is acknowledged. Any use of material in this work that is determined to be �fair use� under Section 107 of the U.S. Copyright Act September 2010 Page 2 or that satisfies the conditions specified in Section 108 of the U.S. Copyright Act (17 USC �108, as revised by P.L. 94-553) does not require the AMS�s permission. Republication, systematic reproduction, posting in electronic form, such as on a web site or in a searchable database, or other uses of this material, except as exempted by the above statement, requires written permission or a license from the AMS. Additional details are provided in the AMS Copyright Policy, available on the AMS Web site located at (http://www.ametsoc.org/) or from the AMS at 617-227-2425 or copyrights@ametsoc.org. 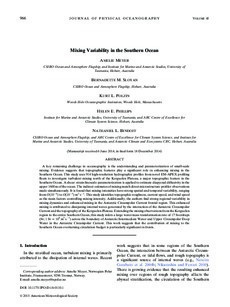 A key remaining challenge in oceanography is the understanding and parameterization of small-scale mixing. Evidence suggests that topographic features play a significant role in enhancing mixing in the Southern Ocean. We use 914 high-resolution hydrographic profiles from novel EM-APEX profiling floats to investigate turbulent mixing north of the Kerguelen Plateau, a major topographic feature in the Southern Ocean. We apply a shear-strain finescale parameterization to estimate diapycnal diffusivity in the upper 1600m of the ocean. Our indirect estimates of mixing match direct microstructure profiler observations made simultaneously. We find that mixing intensities have strong spatial and temporal variability, ranging from O(10- 6) m2 s -1 to O(10 -3) m2 s- 1. We identify the topographic roughness, the current speed, and the wind speed as the main factors controlling mixing intensity. Additionally, we find strong regional variability in mixing dynamics and enhanced mixing in the Antarctic Circumpolar Current frontal region. This enhanced mixing is attributed to dissipating internal waves generated by the interaction of the Antarctic Circumpolar Current and the topography of the Kerguelen Plateau. Extending our mixing observations from the Kerguelen region to the entire Southern Ocean, we infer a large water mass transformation rate of 17 Sv (1 Sv = 106m3s -1) across the boundary of Antarctic Intermediate Water and Upper Circumpolar Deep Water in the Antarctic Circumpolar Current. This work suggests that the contribution of mixing to the Southern Ocean overturning circulation budget is particularly significant in fronts.